CCTV Camera Pros is a direct supplier of security cameras and video surveillance systems for home, business, and government. We sell to DIY installers, resellers, government buyers, and professional installers. We started our company in 2006 with a specialty in CCTV cameras and CCTV systems. As technology advanced, we expanded our product catalog to include the following products. Video surveillance systems that support with remote security camera viewing is another specialty of ours. 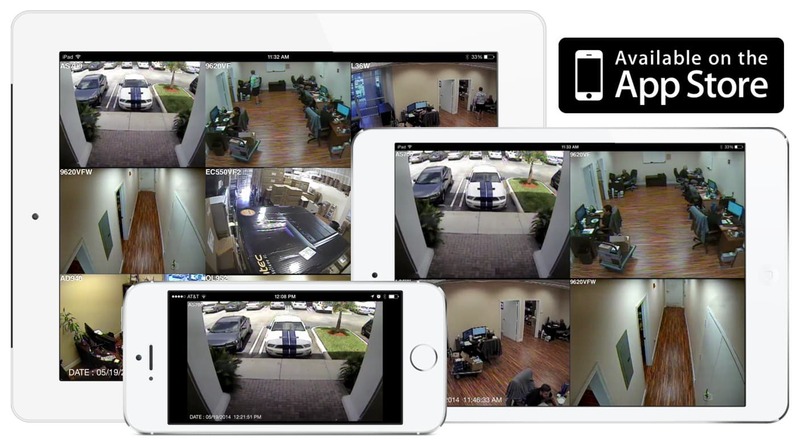 Most of our surveillance systems include DVR viewer software for Mac and Windows PCs, as well as camera viewer apps for iPhone, iPad, and Android mobile devices. We sell many complete systems that are pre-configured and easy to install. The team at CCTV Camera Pros constantly strives to provide the best customer service & technical support in the industry. We also provide the most competitive pricing possible on our products. You can read more about CCTV Camera Pros here. 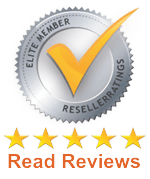 We also encourage customers to check out our reviews and BBB rating. CCTV Camera Pros supplies all major BNC type HD security cameras that are currently being manufactured. These cameras are sometimes referred to as HD-over-Coax cameras, analog high definition, and HD-CCTV. They are are hard wired to a DVR using RG59 coax cable, just like traditional analog CCTV cameras. They support 720p, 1080p, 4 megapixel, 5 megapixel, and 8 megapixel / 4k video resolution. 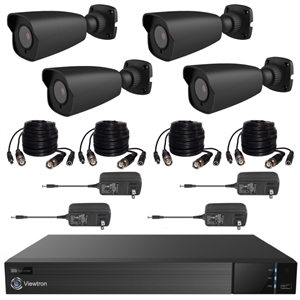 We highly recommend our iDVR-PRO CCTV hybrid DVRs with AHD and HD-TVI cameras. iDVR-PRO does not work with HD-SDI cameras. Learn more iDVR-PRO below. iDVR-PRO Hybrid CCTV / HD camera DVRs support traditional analog CCTV cameras and the latest HD CCTV camera standards (AHD and HD-TVI). 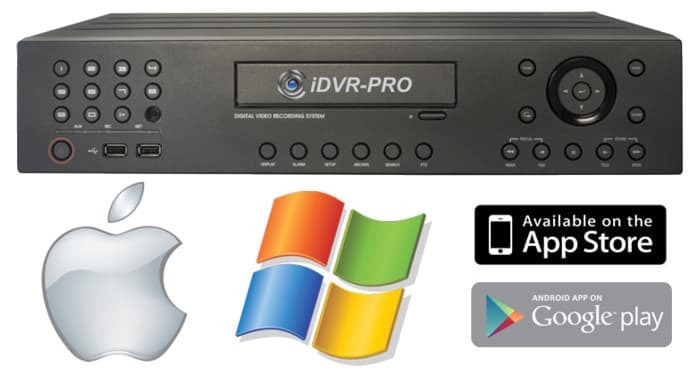 Our hybrid DVRs are extremely practical because they allow customers to use their existing analog cameras (standard definition) and add high definition cameras to their system when they are ready to upgrade. For new systems, most customers use all HD cameras. These DVRs are great for those customers as well because every channel supports video recording at any resolution (D1, 960H, 720p, 1080p, 5MP). With iDVR-PRO, users can view their security cameras remotely over the Internet with the best mobile apps and desktop software available. 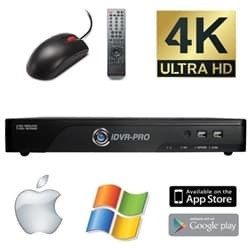 All iDVR-PRO DVRs include remote camera viewer software for Mac and Windows PCs. They are also mobile apps for iOS and Android devices. All mobile apps and desktop software also support search and play back of recorded video surveillance footage on the DVR's hard drive. 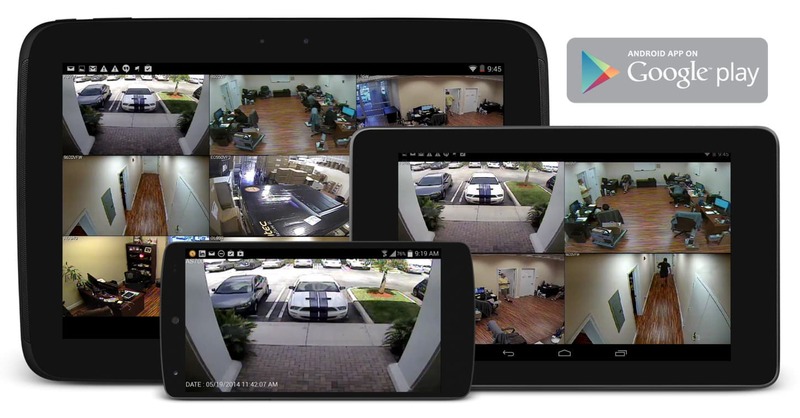 Click here to learn more about the remote viewing security camera apps & software. 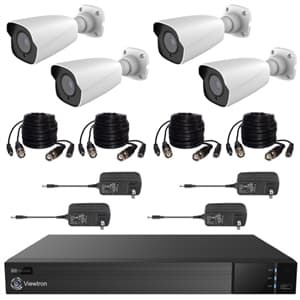 We sell complete HD camera systems that include a DVR, HD cameras, cables, connectors, and power supplies. We can mix and match a variety of camera types based on your needs. We can also upgrade DVRs, power supply boxes, and hard drive space. You can request a custom quote and free consultation below. We realize there are a lot of options available, which is why we provide free phone consultations. CCTV Camera Pros can create a custom surveillance system quote for you consisting of a mix of cameras based on your requirements. We supply everything that you need for professional or DIY installations including cables, connectors, power supplies, and monitors. Most important CCTV Camera Pros provides World Class Lifetime Technical Support from our office in West Palm Beach, Florida. You can use this form to request a free quote and consultation. 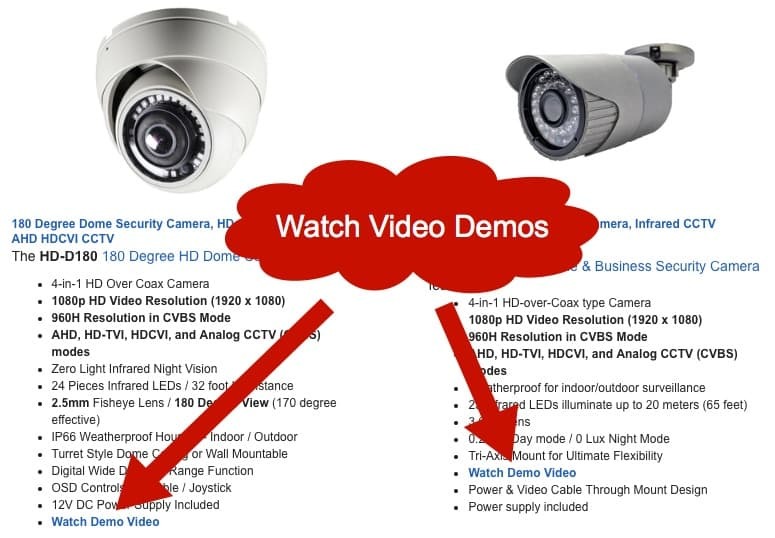 Almost all of our analog CCTV cameras and HD surveillance cameras have links to demo videos available. We encourage customers to see the high quality of our products before they buy them. CCTV Camera Pros has specialized in surveillance systems with remote viewing capabilities since before the first iPhone was launched. Our co-founder, Mike Haldas, designed one of the first iPhone apps available in the app store to view cameras remotely. Since then, our product research and development team constantly looks for the best iOS apps available. At this time, we are recommending the iDVR-PRO Viewer app that is included with our iDVR-PRO CCTV / HD camera DVRs and HD CCTV systems. You can learn more about how to view your security cameras remotely from iPhone and iPad here. Watch this video to see the iDVR-PRO iPhone app remotely viewing security cameras. Watch this video to see the iDVR-PRO app for Android remotely viewing security cameras. 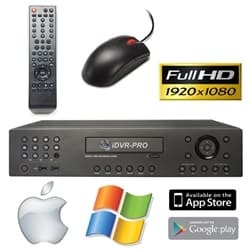 The Mac software for iDVR-PRO surveillance DVRs is the best that we have tested. We highly recommend iDVR-PRO for Macintosh users that want to view their cameras remotely. The latest software supports viewing HD security cameras at full 1080p resolution. 720p cameras display in 720p resolution. In addition to the live view support, the Mac software also supports remote search and playback of video surveillance footage recorded to the DVR's hard drive. Learn more about the Mac iDVR-PRO Viewer software here. Watch this video to see the Mac software remotely viewing security cameras. 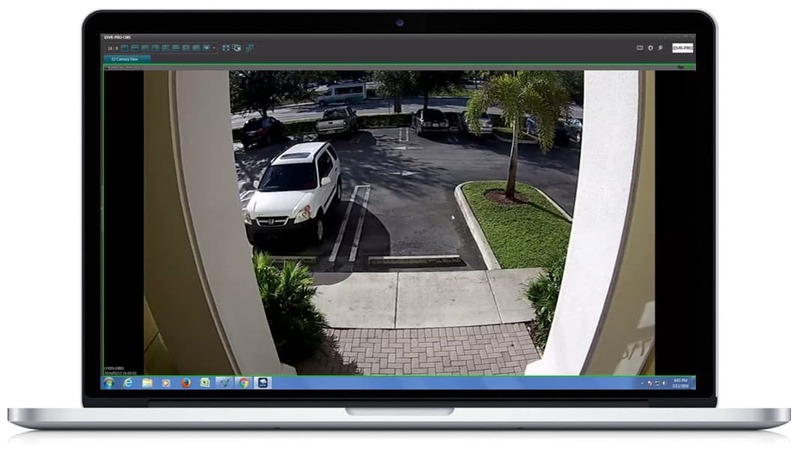 Watch this video to see the Windows software used to remotely view HD security cameras. Here are direct links to some of our best selling products. Security installers wanted to partner with CCTV Camera Pros. If you are licensed installer in your area and are interested in getting listed in our installer directory. Please click here to apply and if you qualify, we will refer local CCTV installation jobs to you. CCTV Camera Pros is a direct supplier of security cameras, video surveillance systems, and CCTV equipment. 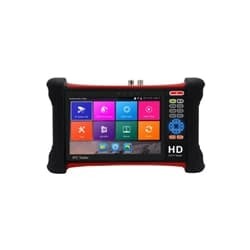 We supply analog CCTV, HD-SDI and network IP surveillance equipment worldwide. The company was founded on June 1, 2006 by Mike Haldas and Greg Bond. Our storefront and company headquarters is located at 7142 N Seacrest Blvd., Lantana, FL 33462. Our local and international telephone is 1-561-433-8488. Our toll free US telephone number is 1-888-849-2288. Our fax number is 800-942-0728. Our customer service email address is info@cctvcamerapros.net.